Moga - a Modern Girl, the third design from the new series Hyakunen no Hana - Flowers of a Hundred Years, self-printed in an edition of 100 in May 2013. Paper size: 33.5 x 47 cm. Series title and print title in blindprinting in the top left margin; signed in blindprinting and pencil in the bottom margin. 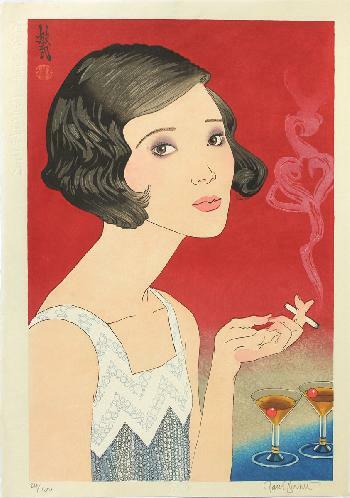 The third of a series of 10 bijin prints illustrating women in the decades of the 20th century. The title refers to young women who escaped from the paternalism and family controls of previous decades and did many things the older generations found shocking. Fine impression, colours and condition: this complex design employed 47 printings and embossing, including silver metallic pigment and 23-carat gold leaf for the stems of the glasses.